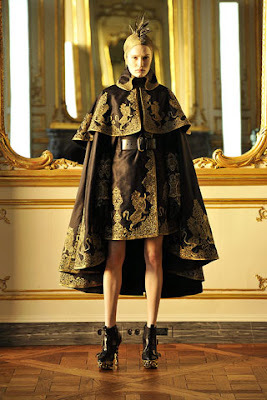 these woman, cloaked in what should be intimidating fabrics, stand instead like demure, golden statues molded by the incredible handcraft of alexander mcqueen. 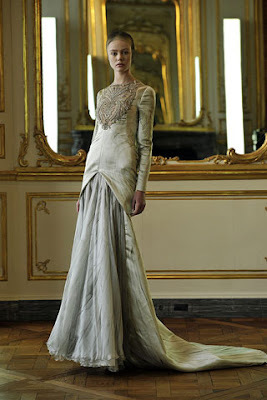 the dresses are all at once warrior-like, imperial, subdued, startling, and (i never use this phrase) breath-taking. the printed fabric was special ordered by mcqueen and has images of archaic angels and demons, replicated from photographs, cast on it, an obvious, yet still genius way to express his dark-aged inspiration. with their pale faces and capped heads, these women pacing slowly down a gilded hall, striking in their ornate appearance, but soft-spoken have the wisdom gained from bearing witness to cataclysmic tragedies, but the grace of every woman of every era. religion is something that i've tried to ward off using every type of repellent, but this collection which is so deeply embedded in the shimmering images of byzantine churches has reminded me that spirituality can, and has, resulted in fantasy inspiring artwork and structures. i experienced another type of spiritual awakening upon viewing the collection for the first time. 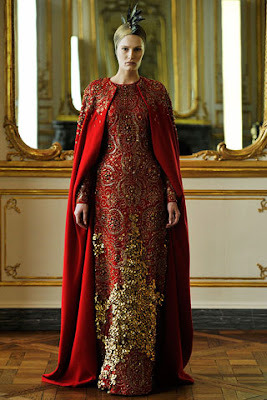 after trying to hide the thought of mcqueen's death so far away from my consciousness, i still cried when my eyes ran over the detailing and the elegant lines. never before have i welled up from looking at still photographs of clothes. i questioned whether it was really just the fact of his death that had crept back up into my conscious that was producing such a guttural reaction. but i realized it wasn't. i was crying and trembling because the designs are simply so beautiful. within me, a realization as to why i love clothes so much flourished. the feeling of indescribable awe, transforming every notion of what beauty really means, sending me through time and back again, still wondering what just happened to me is why i am so invested in fashion. it isn't art, it just is. 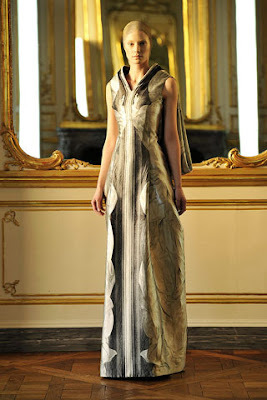 it doesn't need an explanation, even though every fashion journalist tries to attach words to an abstract feeling. 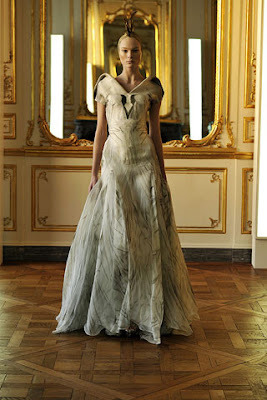 mcqueen's final designs, ornate and startlingly perfect, express just that theory. there is nothing i can say that can accurately describe what this collection is or what it means to me. it is something romantic; something spiritual. It's interesting to see. 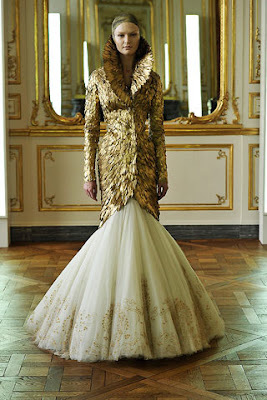 But not anyone can just wear something this beautiful! wouldn't that fulfill almost every little girl's princess fantasy? it's not realistic though so we gotta leave it to the masters of accessible fantasy; the fashion masters. you and me are on the same wave link jess. complete unbridled awe and enthusiasm for this collection.